Diwali is one of the main festivals of Hindu which is celebrated all over the India or by Indians throughout the world with great enthusiasm and faith. On this occasion people clean their house, decorate it with colorful lights and other Diwali decorations, burn crackers, do lots of shopping and off course eats of sweets. But the most important part of the festival is Goddess Laxmi puja which performed on the night of Diwali in the evening to get blessings of Goddess Laxmi and God Ganesha who visit everyone during Diwali and brings peace and prosperity to all. Diwali is a five day festival which begins with 'Dhan Trayodashi' or 'Dhanteras'. The second day of Diwali is celebrated as 'Narak Chaturdashi' which is popularly known as 'Chhoti Diwali'. Third day is the main day of celebration it known as 'Badi Diwali'. The fourth day of the festival is devoted to Govardhan Pooja (worship of Lord Govardhan Parvat) and the fifth day is Bhai Dooj to celebrate the brother-sister relationship. -	First clean the place and spread clean cloth on a higher raised platform or low height stool (red, green, yellow, orange or any other color of your choice do not use black, blue, grey colored cloth) and create a bed of grains (wheat). -	Place the Kalash (pitcher) on the bed of rice. Fill three-fourth of the kalash with water and place a betel nut, a flower, a coin, and some rice in it. Decorate it with mango leaves and cover the Kalash with a plate containing rice grains. Draw a lotus with turmeric powder (haldi) over the rice grains. -	Place the idols of Goddess Lakshmi and God Ganesha on it, if Kalash is not big enough place the idols on platform aside the Kalash (like I do). Place the idol of Ganesha in front of the Kalash in South-West direction or on the right side of it. -	Place a puja thali in front of idols place some silver coins, money, haldi, kumkum, holy water, sweets and other things in this thali. -	Now it's time to call entire family for Diwali pooja, sprinkle holy water (Ganga jal) on your all puja items start your puja with haldi, kumkum and flowers on the Kalash. -	Light 5 earthen lamps in front of idols of Goddess Lakshmi and God Ganesha to get rid from the shadows of evil spirits. -	Take some flower and rice and meditate on God Ganesha first as no pooja will be complete without worshiping him first than meditate on Goddess Lakshmi by reciting the following mantra which is dedicated to Goddess Lakshmi. If you do not remember the mantra than do not worry just remember her by simply closing your eyes with full devotion. 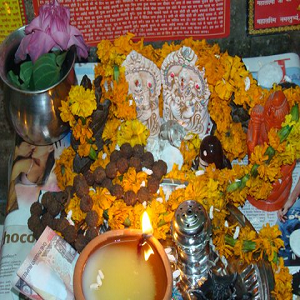 -	After performing the above rituals offer fresh flower garlands, sandalwood paste, kumkum and other daily puja items to idols. Light incense sticks and dhoop in front of idols. -	Now it's time to offer sweets and fruits to god. Also offer Batasha sweets, puffed rice, coriander and cumin seeds which you add into parsad. -	In last perform the arti of Lord Ganesha first followed by Goddess Laxmi Arti with claps and bell and ask for her blessings. -	After performing all ritual touch the feet of your elders to take their blessing and distribute Panchamrit and Prasad among the family members. 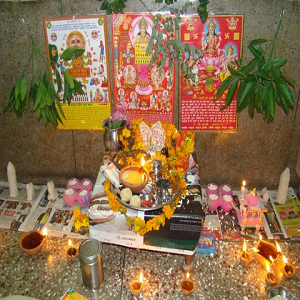 The above mentioned Diwali puja process is the one which I followed in my house as taught by my elders. You can also take the guidance of your elders or perform the above process as it is. May your all wishes come true on this Diwali and all of us get good health and wealth.